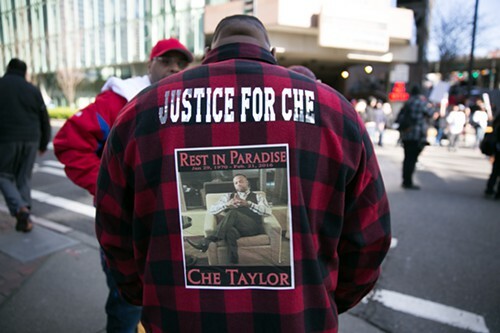 Che Taylor, a 46-year-old father, was fatally shot by Seattle police officers on February 21, while appearing to comply with the officers’ commands to get down on the ground and put his hands up. 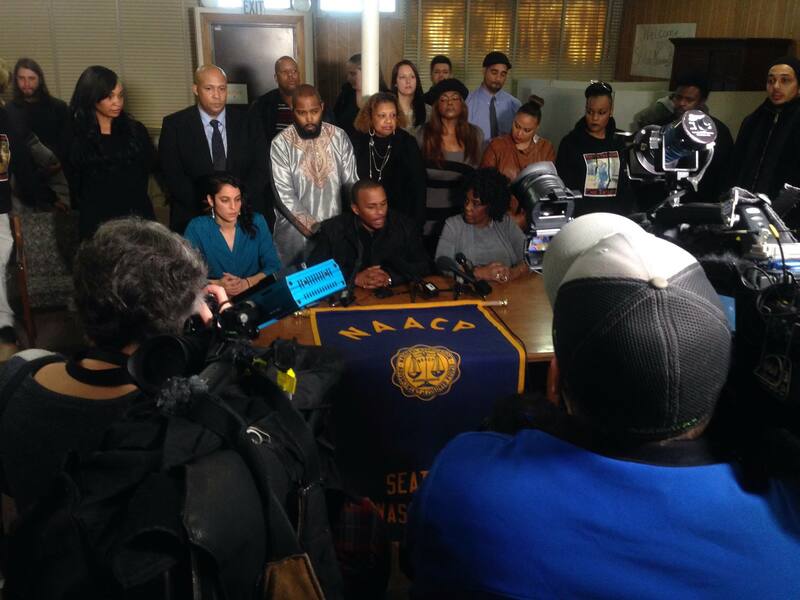 The shooting occurred against the background of the Department of Justice’s (DOJ) findings against the Seattle Police Department (SPD) which found a pattern of excessive and unnecessary force used by officers, especially toward people of color. 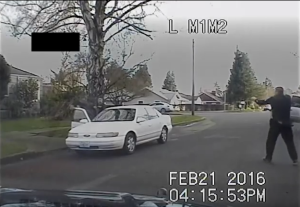 The investigation was mandated in 2010 after SPD officers shot and killed John T. Williams, a partially-deaf Native American man holding his woodworking tools, who did not respond to their calls of “hands up”. The DOJ’s report revealed that SPD officers systematically escalate situations when arresting people for minor offenses. Fifty percent of the cases where police used excessive force involved people of color–in a city that is 70% white. 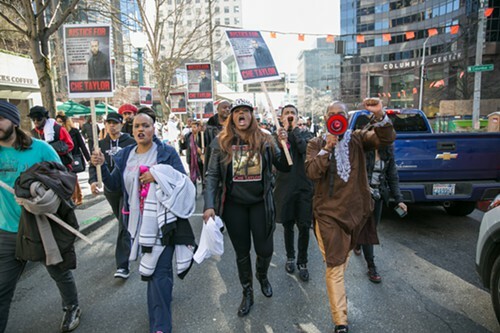 Four days following Taylor’s death, nearly 100 protesters rallied outside SPD headquarters and marched across downtown, chanting #Blacklivesmatter, demanding justice, police accountability, and an investigation of the officers involved. 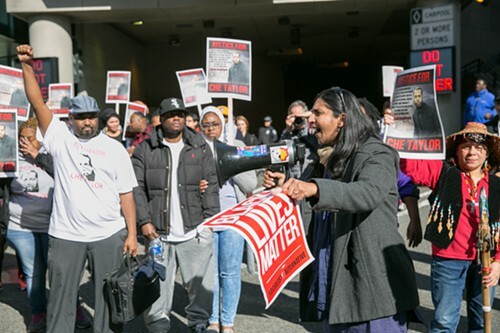 Seattle City Councilmember Kshama Sawant joined the demonstration, calling on Police Chief Kathleen O’Toole to come to a public hearing in front of the City Council. Sawant sent public requests to the heads of both City Council committees empowered to hold such a hearing, Councilmembers Bruce Harrell and Lorena Gonzalez, but both declined to take the initiative. While a closed-door investigation takes place, the corporate media and political establishment have had no problem liberally referring to Taylor’s criminal past to implicitly justify the killing, in spite of the ambiguity of the video footage of the incident. Shortly after the shooting, Mayor Ed Murray announced that Taylor’s death appeared to be justified, although an investigation was needed. 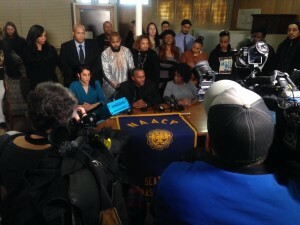 Seattle NAACP President Gerald Hankerson has slammed the police and local media for repeatedly referring to Taylor as an armed felon without concrete evidence that he had a gun, and with existing allegations that the weapon that eventually turned up was planted by the police. How can we achieve #JusticeForChe and police accountability? Socialist Alternative calls for a full investigation of Che Taylor’s death. If the City Council won’t agree to hold a hearing, then the public should demand one. Black Lives Matter activists and members of the community should come together to demand a hearing and real police accountability, not just perfunctory reforms. While the DOJ has sung the praises of the SPD reform project, activists and community groups have broadly criticized the reforms as superficial. The DOJ’s process included the creation of a temporary civilian oversight board, the Community Police Commission. But in 2013 the 15-member commission unanimously threatened to resign, protesting its extremely limited authority to in to carry out real use-of-force reforms needed. Later, when the commission put forward legislation to become a permanent body, the federal judge overseeing the process used a heavy hand to stop the proposal in it’s tracks. A democratically elected community oversight board has become one of the key demands Black Lives Matter has put forward. Such boards would need full powers, including the power to subpoena police officers, is an essential starting point to begin holding police accountable. We cannot have illusions in either corporate party that benefits from the disenfranchisement, poverty, and criminalization of the working class, especially the black working class and poor. Last November in Chicago, Black Lives Matter activists shut down national chain stores on Black Friday in protest against police brutality. In December thousands took to the streets in Chicago, blocking intersections and the interstate, calling for Democratic “Mayor 1%” Rahm Emanuel to step down for covering up the police murder of a black teenage boy during his campaign. 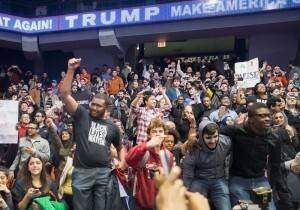 This month, hundreds of Black Lives Matter activists and Bernie Sanders supporters protested at a Donald Trump rally in Chicago, calling out his racism and anti-immigrant fear-mongering, and shutting down the event. Winning greater police accountability will require building our movement and standing up to the political establishment–both the Democrats and the Republicans–for being complicit in a system that perpetuates abuse of police powers. As in Chicago, we must expose the Democratic Party in Seattle for what it is: a force that will dig in its nails at every turn to protect establishment interests, not the interests of working people.